From a commuter’s perspective, words like condition monitoring and prediction-analytical techniques may not matter much to their commuting experience. What weighs heavily in their minds are questions like how crowded will the next train be, how long do I have to wait for my next train, and will I be able to reach my destination safely and on time? At SMRT, we continue to have an unwavering commitment towards our commuters and have undivided focus towards solving present issues. We are fully aware that our rail system is an integral part of our lives, intricately weaved into our everyday lives. Our current maintenance approach is targeted to solve present track or train related issues during engineering hours nightly. However, as our rail systems run 365 days without rest, we can no longer rely on traditional maintenance methodologies. 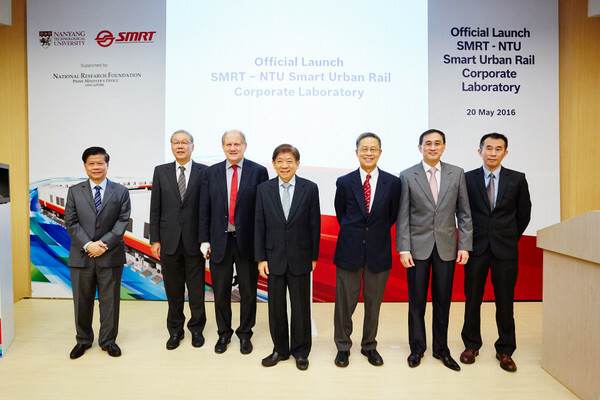 Today, the SMRT-NTU Smart Urban Rail Corporate Laboratory (Corp-Lab) was officially launched by Coordinating Minister for Infrastructure and Minister for Transport, Mr. Khaw Boon Wan. Corp-Lab is a collaborative platform where SMRT partner academia and fellow industry partners for knowledge exchange. NTU’s scientific and renowned research capabilities; together with SMRT’s operational expertise will help deliver real-life customized solutions that will serve the needs and problems faced by our rail systems. Till date, we have had success with the introduction of condition monitoring systems through preemptive failure warnings of critical components and systems. For example, the Third Rail Sag Alert system managed to capture 14 warning triggers in 2015. Going forward, Corp-Lab will focus on two research tracks. The first aims to develop advanced condition monitoring system that will further enhance the resiliency and safety of our network. The second is targeted to enhance overall integrity and reliability of our rail assets. Through Corp-Lab and NRF’s Corporate Lab @ University scheme, we aim to deliver customized solutions, strengthen our rail network by detecting potential faults earlier and increasing the pool of industry-ready experts. When we are able to do so, this will translate into smoother and uninterrupted journeys for our commuters in our rail network. We spoke to our engineers to understand how our trains are protected from lightning strikes. Each train is protected by a “Faraday Cage”. This is an enclosure formed by conductive material that blocks electric fields and electric currents such as lightning strikes. 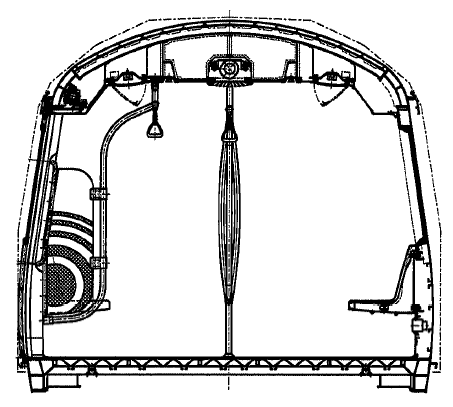 The cage conducts current around the outside of the enclosed space with none passing through the interior. In this case, the metallic exterior of our trains is the Faraday Cage that protects everyone inside from electric currents. Even if you’re holding onto the grab pole, you will still be safe as grab poles are attached securely to the train’s interior and are not connected to the external frame. If lightning strikes, the electric current will travel through the outside shell of the train, not through the cabin, and pass through the wheels to the track. The train is grounded to the track. This process of shielding is used in cars and planes as well. You may have read on the news that lightning struck a location between Yio Chu Kang and Khatib Stations along the North-South Line on 11 May 2016. This caused a train fault, affecting commuters travelling towards Yio Chu Kang Station. Commuters on board the affected train were safely disembarked at Yio Chu Kang Station. As a precaution, our engineers also tested the trackside equipment to ensure that it was safe for trains to move over the affected area. Initial findings show no indication that our train was directly struck by lightning. We suspect that lightning could have hit a nearby area close to the train and indirectly affected the performance of electronics on the train which resulted in a train fault. Lightning related incidents are a relatively rare occurrence. We have had an average of one or two such incidents in recent years. We would like to reassure all our commuters that our trains are designed to safely protect them in adverse weather conditions, such as lightning strikes. 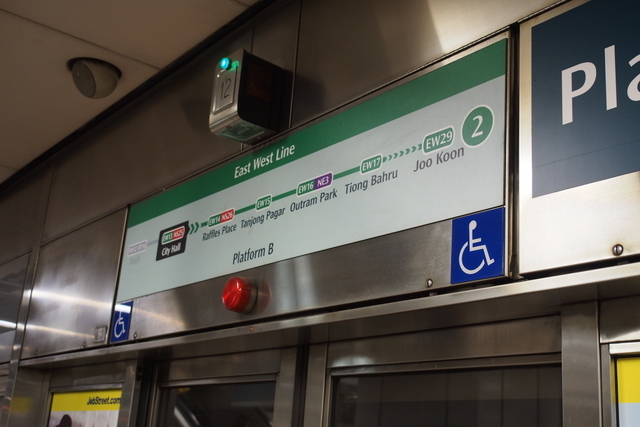 The North-South and East-West Lines (NSEWL) are two of Singapore’s oldest heavy rail lines. These lines carry almost 2.5 million passengers from as early as 6am to around midnight each day. Maintenance teams have only a few hours each night to rectify any infrastructure faults that may cause interruption to train service the following day. Relying solely on the human eye to discover faults across the 200km length of track on the NSEWL would be like searching for a needle in a haystack. How do we overcome these challenges? 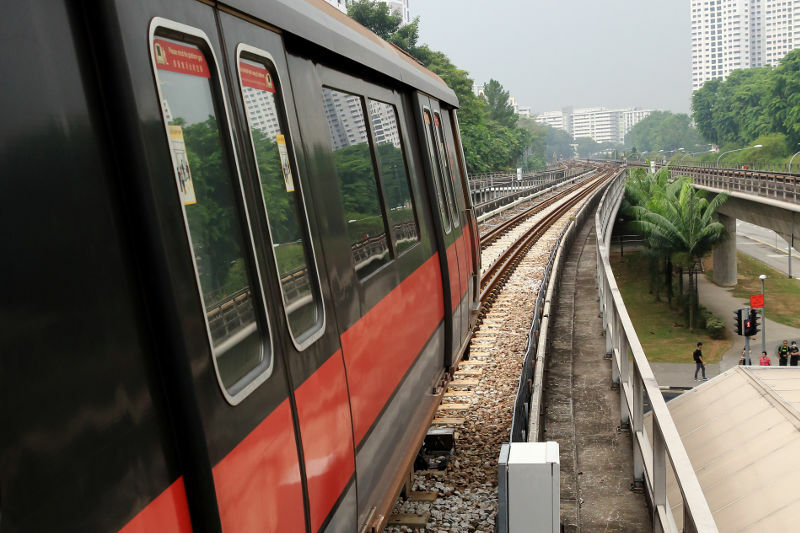 It was thus important for SMRT to develop a suite of condition monitoring systems to properly observe and gauge the status of the track and other components in the network, enabling maintenance teams to better plan maintenance schedules and priorities. 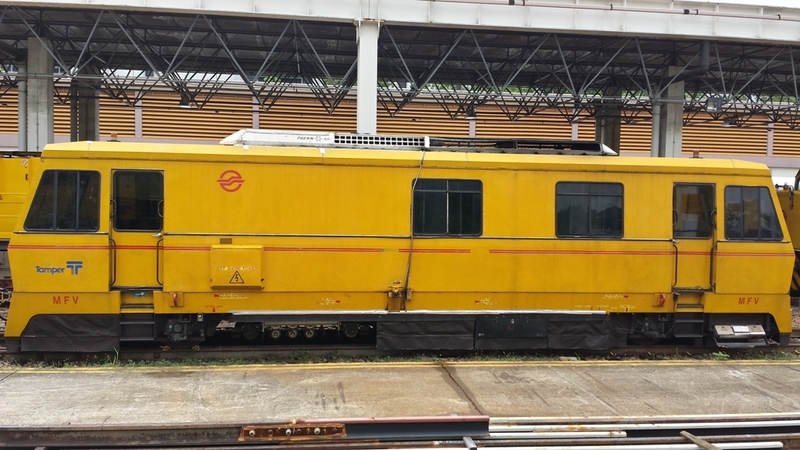 SMRT has been building its capabilities with condition monitoring technologies as early as 1995, with the introduction of the Multi-Function Vehicle (MFV). The MFV can scan long stretches of track, if not the entire line, to collect data that relates to track geometry, rail flaws and other measurements. In this series of blog posts, we will introduce the rest of the condition monitoring technologies and how they help our maintenance teams. # 2: LVDT is also referred to as Third Rail Sag Detection System. It monitors the overall alignment of the power providing third rail. #3: RailVision was introduced in 2009 and uses a combination of image capture and detection systems to identify faults on a track. #4: RailVision is able to cover the entire NSEWL in a matter of hours. It would have taken days for patrol teams to cover the same distance. #5: Multi-Function Vehicles (MFV) were first introduced in 1995 and has since been evolved under the Engineering Trains Branch team. #6: MFV use other systems, such as one that utilises ultrasound technology, to detect rail condition. #8: In order to measure both rails at the same time, the Laser Trolley had to be customized according to SMRT’s specifications. #9: The small rocks that the tracks rest on are known as the ballast and they have to be monitored as well. #10: The conventional way for checking the ballast is to dig out and send samples to labs for testing. Follow our series on Condition Monitoring as we go deeper into each condition monitoring device. Millions of commuters travel on our transportation network daily. Lot’s of us know the stations and interchanges so well that we breeze through them on auto-pilot, with eyes glued to our phones. Admit it, you and I are guilty of that once in a while. We’ve walked the same route for years and it has become second nature to us. However, for passengers with disabilities, the daily commute can be a constant challenge. For someone on a wheelchair, something as small as the 75mm gap between the train platform and the train can be an obstacle to overcome. 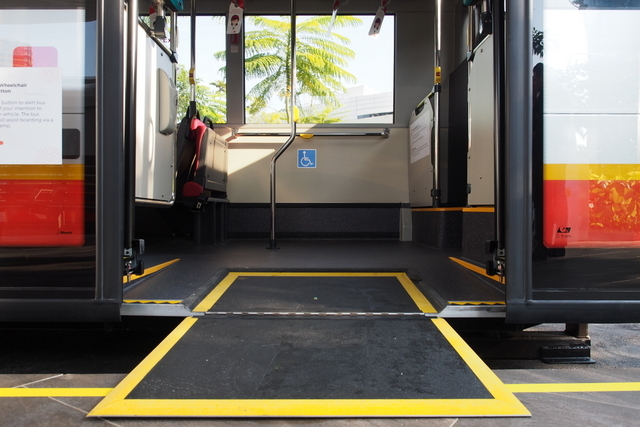 There are many accessibility features on both trains and bus networks to help narrow the metaphorical gap that passengers with disabilities experience daily. 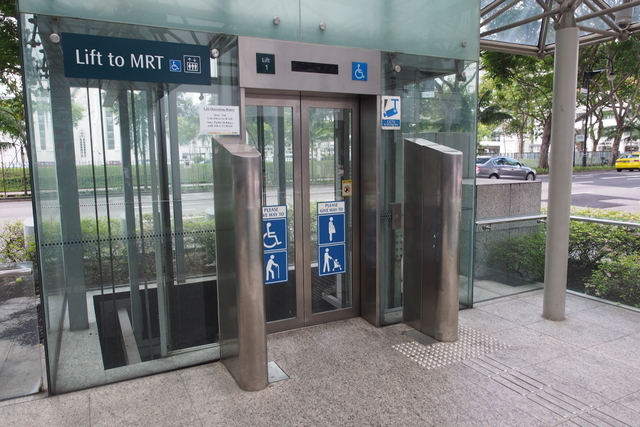 In SMRT’s early days, passengers on wheelchairs would have trouble entering our stations as there were only staircases and escalators to reach the concourse levels. Today, all stations will have at least one entrance that passengers on wheelchairs can use. 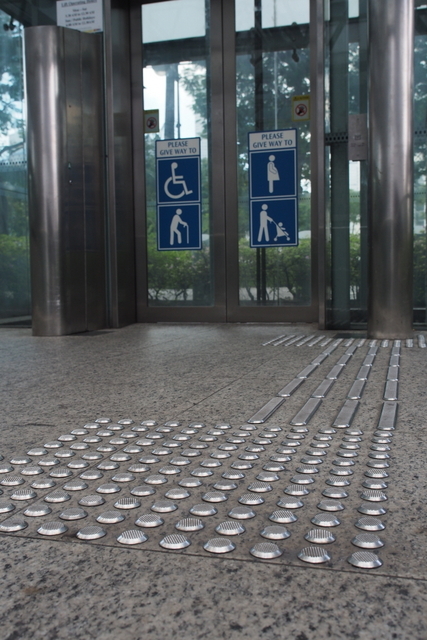 The bars and bumps on the ground are known as tactile paving. They are there for the visually impaired, forming a path leading from platform to important places in the station, such as the fare gates. Have you also noticed that the tactile paving always leads to the wider fare gate? 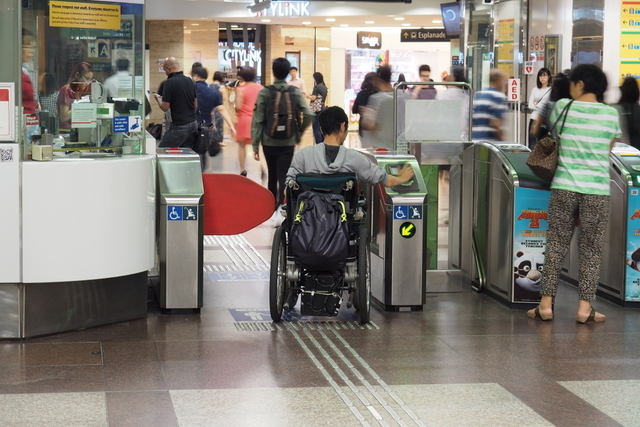 Wider fare gates were introduced to allow wheelchairs to pass, as well as bulky items. These gates are bidirectional, making it more convenient for the passenger as they do not need to approach a Station Staff to help them turn the gate to a certain direction. 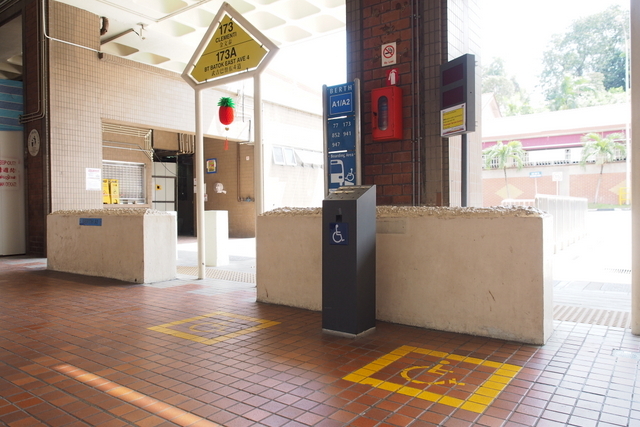 At the platform, passengers in wheelchairs should look out for the wheelchair indicators on the platform screen door or platform floor. These indicators reflect where the wheelchair spaces are on a wheelchair-accessible train carriage. There are two such spaces per train. Some trains also have the grab bar closest to the train doors removed, allowing passengers with wheelchairs or strollers to enter the train easily. There are also visual indicators for the hearing impaired. 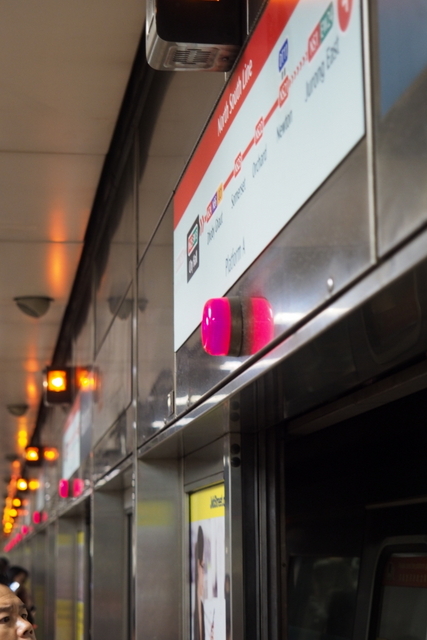 The prominent flashing red lights above the platform screen doors indicate when the train doors are closing. Special boarding berths at some interchanges were modified for passengers in wheelchairs. Wheelchair bound passengers who wish to board a certain service number can state so via a console at these berths. The next bus will swing by the berth to pick them up. Passengers in wheelchairs indicate their intention to board a wheelchair accessible bus by pressing the blue button next to the exit doors, triggering a special alert to the Bus Captain. The Bus Captain will then deploy the ramp and help the passenger on board the bus. 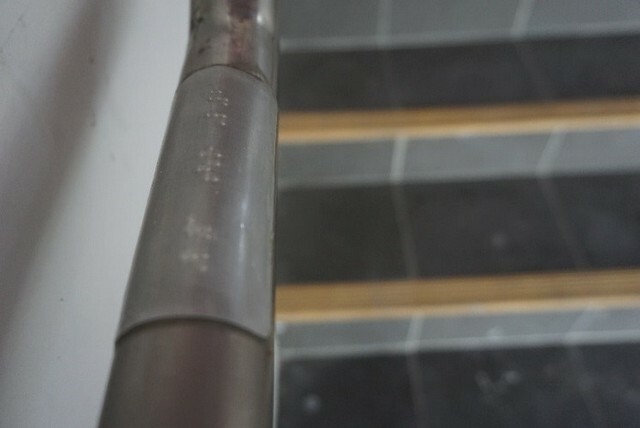 At the new Woodlands Temporary Bus Interchange, there are “signs” in Braille on the handrails to help the visually impaired locate waiting areas.